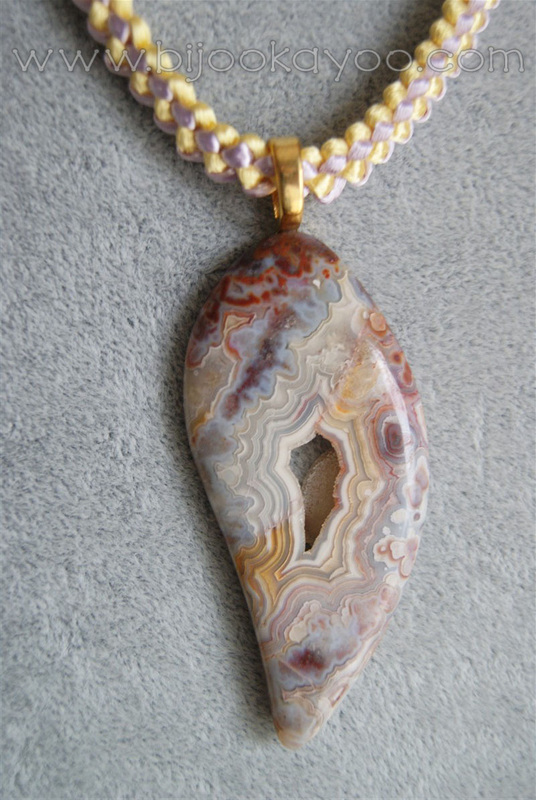 I found this beautiful pendant at a local gem show organised by the Port Moody Rock and Gem Club. I loved this natural stone, not only for its shape but also for its mix of colors. I wanted to keep its brightness and subtle purple touch in the chain, but I didn’t want the chain to be too heavy. So I chose a Phoenix Tail knot made of 1.5mm satin cord, allowing it to be slightly smaller. At first, I thought about adding beads in the chain but decided to keep it really simple. 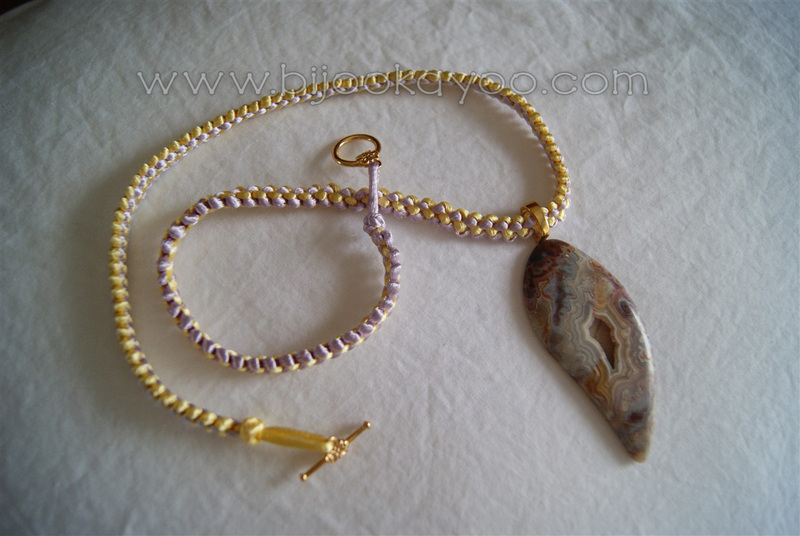 This necklace is made of two 1.5mm satin cords, a light purple one and a light yellow one, and a purple/brown/blue natural stone pendant I bought from the local Port Moody Rock and Gem Club. 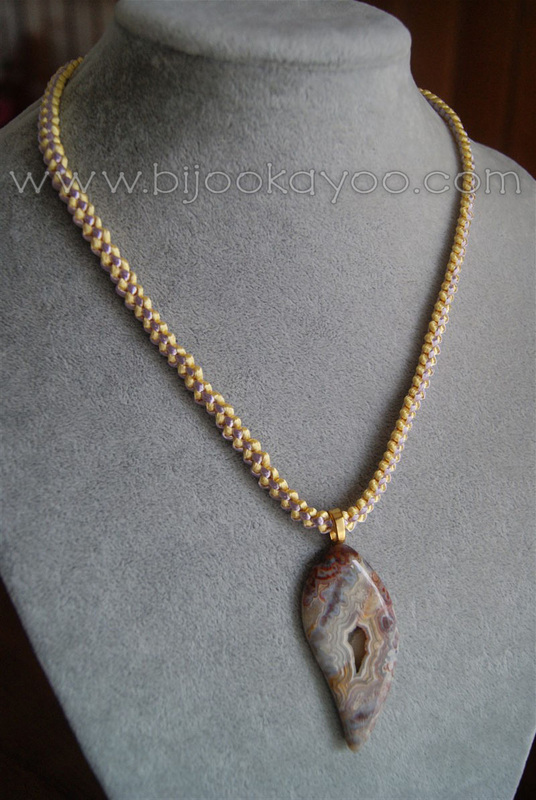 It features a chain made with a Phoenix Tail knot ending with Button knots. Thus, the Phoenix Tail knot, also known as the Fortune knot, symbolize good fortune and favorable fate. And the Button knot is a symbol of good luck. Posted in NecklacesTagged blue, brown, button, chinese, club, cord, gem, knot, light, natural, necklace, pendant, phoenix, Port Moody, purple, satin, stone, tail, yellowBookmark the permalink.